The Little Sweep was a joint FGS/FGGS production (along with One-Way Pendulum) and was reported and illustrated in the July 1973 issue of the Farnhamian. The Little Sweep is an opera for children in three acts by Benjamin Britten with a libretto by Eric Crozier. “Once the performance was under way, and the dicey bits were brought off with reasonable success, the nervousness grew less. One was actually aware of the lack of space backstage, the bright lights, and the rows of blank faces. “The two performances came off surprisingly well, considering the panic and depsondency of the dress rehearsals, and the hurried last-minute reference to copies. Mrs Fairey’s constant pleas to ACT were quite forgotten in the heat of the moment, but whether for good or bad is questionable. There certainly were instances of puppet-like blankness. However, the audience seemed to enjoy it, judging by their lusty singing; out timpanist told of some children in the front row who were on the edge of their chairs in horror at one high point of the opera. This photograph of the cast also appeared in the Farnhamian. 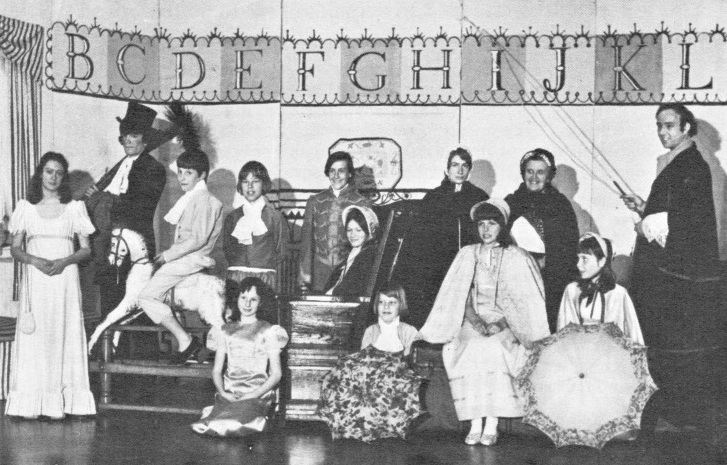 Identifiable are Susie McBride (Pringle), who is kneeling to the right of the rocking horse; Mrs Vivienne LeGrice (standing under the letter J); and Chris Chapple (far right). If you can identify anyone else in the photograph then please let us know.